Valentines day is just around the corner so I’ve been very inspired by all the festivities and Bohemian styles. If you’ve been following my blog for a while you’ve probably noticed that I’m really into making miniatures lately. So incorporating a bohemian theme inspired from earrings I’ve seen online, I decided to make a mini dreamcatcher statement earring. 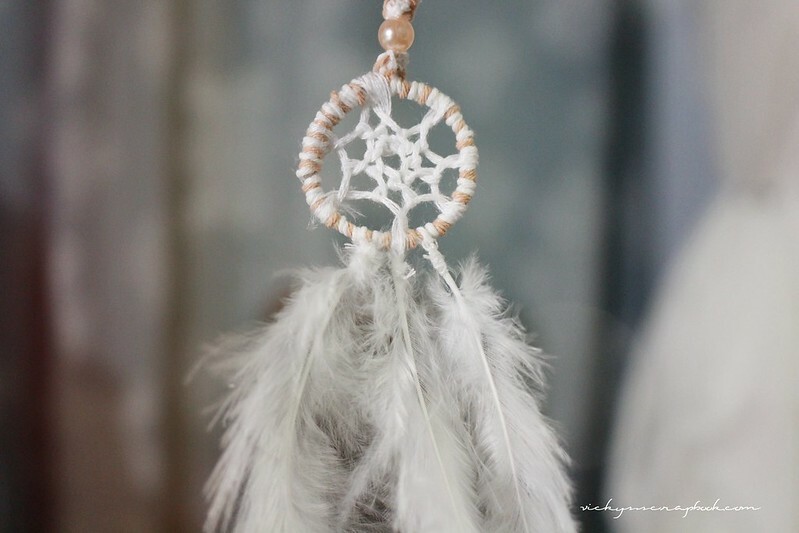 I think this is a very fitting DIY for the Valentines season since the dreamcatcher could be very romantic with a free-spirited vibe. Similar to the dreamcatcher I’ve made in a previous post, I taped a wire into a circle of a comfortable size for my ears. Using the same twine from the previous DIY, I wrapped it all the way around the circle and tied a knot to secure. I used embroidery thread to weave in a pattern (I used the same pattern as the larger dreamcatcher that I made). After I’m done with the weaving, I cut off the excess twine and used the excess to create another knot). I then pulled a thread through it the first knot and through that thread, I attached a bead. With the second knot, I cut off the excess and sewed it in with the bead. Once I was happy with the pattern, I sewed the earring hook on top. Using the thread and needle, I then sewed in the feathers to the bottom. I poked a hole into the ends of the feather to use as an anchor for sewing it onto the twine covered circle. You could also glue the feathers but I prefer sewing and then once I’m happy with the look of it, the earring was completed. I think the other ear could be a simple stud earring so there’s only one earring to make in this pair. I’m working on another Bohemian inspired earring which I will post later next week. Though I’m prepping for another holiday, today is actually the Lunary New Year. Happy Lunar New Year everyone! P.S. I opened an Etsy shop. Though there’s only one listing for now, please check it when you get the chance! These earrings are so pretty! 😀 ❤ Hehe they're perfect for the spring/summer! I want a pair too kekeke! Hehehe okay ❤ Can't wait 😀 😀 😀 Thank youuuuuu! Cute earrings and congratulations on launching your Etsy store! These are so adorable ❤ I love making things. Oh I miss coming here, and you’re the awesomest jewelry maker, you make it look so easy, lately i’m drawn to boho stuff and this looks good, i’ll try this ugh i neeed luck though haha,Happy Valentine’s day Vicky,xoxo BING. Thank you for your encouraging words and Happy Valentine’s day!